So since it was groundhog’s day recently, I realized what a truly strange and white person holiday it is. Like there are dudes in top hats holding an animal (that doesn’t really want to be bothered) trying to use it (him?) as a weather forecaster. IT’S ABSURD. That being said, since I’ve heard we “have 6 more weeks of winter” or whatever, I’m looking forward to the spring. Spring and Fall are my two favorite season because of…well a lot of reasons, but mainly because they’re the best for clothing. I’m pushing forward to the future and looking to some serious spring inspiration with Uniqlo. I recently was featured on their website (here!) and got the opportunity to show of my style through their basics. Everyday I wear a staple pieces to help balance out my wardrobe. I picked up some more staple items for you guys to take a look at, here, on my blog! I’ll have another look coming next week, as well! For my first look, I utilized the wonderful transitional staple that is the ribbed sweater. The reason this piece is one of my favorites is not only is it a good layer to have when you’re in-between seasons, but it allows you to wear white and look like spring (even if it’s 45 degrees in New York). 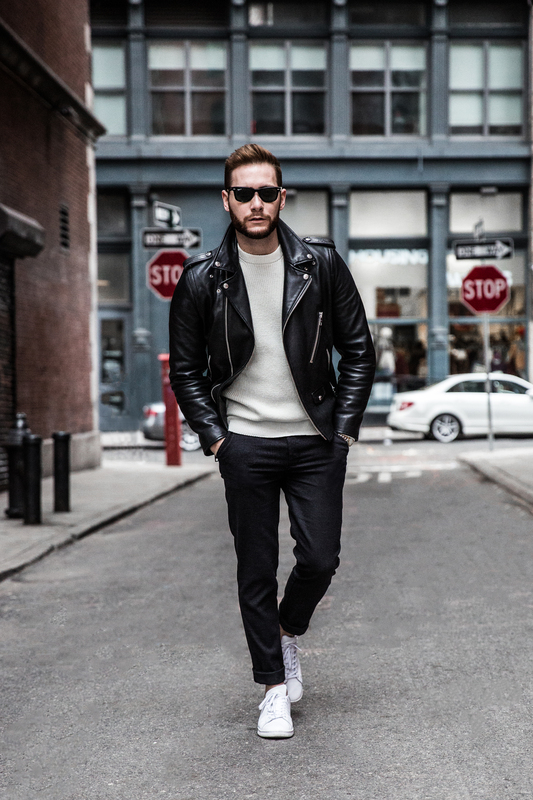 I threw on my favorite leather jacket, a pair of tailored knit pants, and a white Stan Smith to pull the whole look together.